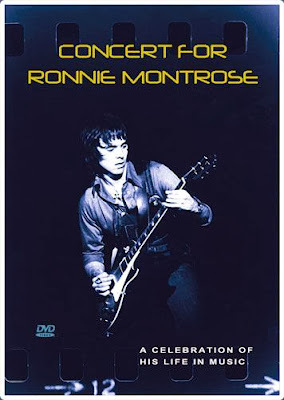 The “Concert For Ronnie Montrose - A Celebration of His Life In Music” will be released on DVD on December 10. Following Ronnie’s death March 3, 2012, friends and musicians gathered at San Francisco’s Regency Ballroom six weeks later (April 27, 2012) to pay homage to one of rock's legendary and influential guitarists with a tribute concert. The resulting DVD from the event features performance by Ronnie's past band members in Montrose (Sammy Hagar, Denny Carmassi, Bill Church with Joe Satriani), Gamma (Davey Pattison, Denny Carmassi and Glenn Letsch with Marc Bonilla), performing both groups' hits. Ronnie's colleagues and people he mentored and produced over the 40 years of his career are featured as well, including Neal Schon (Journey) Ricky Phillips (Styx), Steve Smith (ex-Journey), Ed Roth, Jimmy Paxson (Stevie Nicks), Jeff Watson (ex-Night Ranger), Tesla, Eric Singer and Tommy Thayer (KISS), Eric Martin (Mr. Big), and more. The DVD will also include interviews, bonus features, a photo gallery, and an additional set of Ronnie's hits by an all-star band featuring Chuck Terpo, Mario Cipollina, Tal Morris, Dave Meniketti and the members of Y&T; this was recorded and filmed at Bob Weir's TRI Studios. Ronnie Montrose has been called the Father Of American Hard Rock. In his short time with Van Morrison, Ronnie created the iconic guitar riff for the classic song “Wild Night”. In the Edgar Winter Group, he left even a bigger mark with his catchy heavy-handed riffs on songs like “Free Ride” and “Frankenstein”. But it would be his self-titled release, “Montrose”, that would become the cornerstone of American hard rock. The 1973 debut crafted classics like “Rock the Nation”, “Bad Motor Scooter” and “Space Station #5”, laying the ground work and became the template for bands like Van Halen and countless subsequent musicians. Ronnie died from a self-inflicted gunshot wound following a five year battle with prostate cancer. "Concert For Ronnie Montrose - A Celebration Of His Life In Music"